SPACEPORT NEWS Page 3 May 16, 2003 The Space Based Telemetry And Range Safety (STARS) effort will provide a more effective, more economical means of maintaining tracking and communication linkage with space launch vehicles than is currently available with existing ground-based systems. STARS team members are currently testing Range Safety and Range User hardware. This effort is in preparation for STARS Flight Demonstration 1, which is the first in a series of three activities, each testing a different functionality, improved capability or operational environment. STARS will demonstrate, through this hardware testing, the capability to utilize a space-based platform to provide reliable communication and tracking for a variety of launch vehicles. The team will use existing, proven satellite systems such as the Tracking and Data Relay Satellite System (TDRSS) and Global Positioning Systems to minimize flight demonstration risk. These trials for this Next Generation Launch Technology (NGLT) project are ongoing at Kennedy Space Center for Flight Demonstration 1, scheduled for May at Dryden Flight Research Center (DFRC). The flight demonstrations will exhibit vehicle position tracking data abilities during over-the-horizon flight operations. It will also determine the probability of forward and return satellite links for real-time monitoring. This testing exercises the equipment and systems as they will be configured and operated during the demonstration tests, said Rich Nelson, chief of Range Systems Design and Development. In addition, procedures are being tested and evaluated in preparation for the flight testing. According to lead engineer Erik Denson, the tests, which check data circuits, timelines and other essential systems, continue to be successful. Specifically, TDRSS is used during the dry runs to verify these factors are properly configured and correct to support flight. This is a large task,Space flight communication upgrade tested at KSCconsidering the distance and number of centers involved, said Denson. KSC (STARS management Center) shares project responsibilities with DFRC, Wallops Flight Facility, Goddard Space Flight Center, White Sands Complex and Marshall Space Flight Center. NGLT combines previous Space Launch Initiative research and development efforts with cutting-edge, advanced space-transportation programs to increase the safety, reliability and cost-effectiveness associated with developing the nations next generation reusable launch vehicle. Visit www.slinews.com for further NGLT information. Primary and secondary students from all over the state conquered dreary weather to attend the annual national Space Day activities at the Kennedy Space Center Visitor Complex May 1. To expose attendees to space flight milestones and career possibilities, the event was packed with educational activities in addition to the complexs traditional offerings, such as Center tours and an IMAX movie. Before making their way to the first experience, students learned about vehicle design by assembling and testing straw rockets. Pamela Biegert, KSCs Education Programs and University Research Division chief, then welcomed the group at the Universe Theater. This year celebrates the Centennial of Flight, she said. Imagine what the world will be like 65 years from now. Well probably be living and working in space. Its going to be a high-technological society. I want you to prepare yourself for that. Millennium Middle School students displayed their awardwinning Space Day Design Challenge exhibits so Universe Theater passersby could see the effort of our future pioneers. Their hard work was definitely seen by the crowds attending the Exploration Station presentations. During these demonstrations, the audience learned about sound travel and liquid gases, how the International Space Station is steered via a bike tire experiment, how a gyroscope operates and much more. They were also offered safe ways to replicate experiments at home to continue the hands-on learning. Third-grader Justin Crenshaw shared his enthusiasm. Im excited to see the IMAX movie, the space shuttle, and why we go into space more than once. The liquid gas experiment helped meet the wishes of Marissa Peri, third grade. I want to learn about how the shuttle and rockets take off. Students were also invited to gain knowledge about airplanes during KSCs KARS Flyers demonstrations. At the Center for Space Education, participants were welcomed by a room full of electric airplanes. Also, when weather per-! "#"$%&'(%)*+,-'.,+,/&0$,# 10$"%20+'3*0.,'405mitted, they were even able to see several of the planes fly outside. Space Day was a family experience for the Zabala family. The three sisters are taking very active roles in the activities. Im looking forward to learning about space and technology and seeing the model airplanes, said Stephanie Zabala, seventh grade, who worked on one of the Millennium displays. The other two sisters from Seminole High School attended Space Day as a reward for their previous hard work. We participated in a Space Settlement Contest where we had to sustain 100,000 people in space. We came in second place, so thats why we get to come, said Nathalie Zabala, ninth grade. Im really looking forward to the webcast to see John Glenn, and to see the others, like astronaut John Fabian, that we can learn from. The Cyber Space Day webcast was indeed a unique opportunity. The continuous coverage, located at the Exploration Station, included role models like Glenn and Fred Gregory, NASAs deputy administrator. While many activities were ongoing, Space Days official conclusion was the information and question session with NASA astronaut John Fabian. Afterward, teachers were given parting educational materials for their continuing classroom activities. Further KSC education program information can be found at www-pao.ksc.nasa.gov/kscpao/ educate/edu.htm .These students from Millennium Middle School display their Space Day Design Challenge exhibit at the Universe Theater in the KSC Visitor Complex. Page 4 SPACEPORT NEWS May 16, 2003 The Canaveral Council of Technical Societies (CCTS) created Space Congress in 1962 to stimulate interest and promote professionalism in the space program. This annual event provides a forum for space professionals to meet and share their knowledge of technical areas and issues facing the space program in this country, and to learn the latest advances and successes. Space Congress is organized in cooperation with NASA, the Department of Defense, industry and academia. This year the event celebrated 40 years of Space Congress, the 40th anniversary of Kennedy Space Center and 100 years of heavier than air flight. The April 30 Space Congress luncheon featured General Michael Kostelnik, NASA deputy associate administrator for the Space Shuttle and International Space Station (ISS). His responsibilities include corporate-level management of program safety, budget, performance and schedule requirements for both programs. Among the topics he discussed were the future challenges NASA faces and the role of the Space Shuttle program. People talk about if we should build another Shuttle, said Kostelnik. Losing this Shuttle was a great tragedy, but it does not have to have a significant impact. In fact, we are looking at the impacts of what we can do, but from a program prospective were going to come out of this with three strong flyers. Three shuttles is a sufficient fleet to do the task, but weve got to find out what the problem with Columbia was and weve got to fix that problem. I think we can do this in the near term. Kostelnik then told the audience they were making history as they complete the ISS, which will bring tremendous opportunities for NASAs long-term future. Many years from now this will go down in history as a significant time period for human space flight and for NASA, he said. You can count on from the top of the program management chain, which starts with Administrator Sean OKeefe, down to the lowest level of the infrastructure, that this team needs to get ready for a very exciting challenge. He then spoke about Kennedy Space Centers role in building the ISS. Here at the Kennedy Space Center, with General Bridges and his team, I know the Shuttle is an important part of that activity, the same way the International Space Station is sitting here ready to be launched into space for assembly as well, said Kostelnik. The Space Shuttle is here to support the International Space Station. It is no longer a standalone entity. The primary focus of the Shuttle fleet is the International Space Station. Kostelnik then talked about the future. We will never forget Columbia, he said. I think the lessons to be learned will be different (from Challenger). Whatever those lessons are, NASA will incorporate those things and will move on to continue a tough job because that is our mission in life. Space is now, and has never been, without risks and that will continue because our technology is not perfect. But the people associated with this, the contractors, the community, the whole space infrastructure, Im convinced are dedicated to doing this tough jobThis years 40th Space Congress shows the (Above) NASA astronauts spoke to students about the merits of studying science and math, then anwered various questions. (Below) KSC Director Roy Bridges Jr. talks to two students about his background at An Evening With the Astronauts. (Left) Dennis Tito (on left), is introduced by Space Congress General Chair Kevin Hoshstrasser (right) at the Space Congress Gala. (Below) NASA Propellants Group personnel staff their display, which focused on hydrogen technologies. From left are Ken Madyda, H.T. Everett (lead), Chuck Davis, Jason Heminger and Lee Leland. Page 5 SPACEPORT NEWS May 16, 2003 as good as anybody can do. The International Space Station is only partially assembled. The most important parts remain here on the ground and we must get ready for that task. Remembering our past, reviewing our present and looking toward the future of the U.S. Space Program was the theme of an informal panel discussion led by JoAnn Morgan, director of External Relations and Business Development at Kennedy Space Center, during the May 1 session of Space Congress. Titled Linking the Past to the Future, Morgans panel guests included John Young, associate director, Johnson Space Center; Gen. Forrest McCartney, vice president, Launch Operations, Lockheed Martin Astronautics; James Rose, former assistant administrator for commercial pro-link to past, present and future technologiesgrams at NASA; Doug Cooke, Space Architecture technical manager; and Gregg Maryniak, executive director, X-Prize. Young gave a presentation covering his Apollo 16 moon mission and the first Space Shuttle mission  the launch of Columbia on STS-1. In reference to continuing NASAs tradition of space exploration, he concluded his presentation by saying, I think the moon is in our future. General McCartneys presentation focused on his hopes for the Space Program during the next 10 years. Specifics included exploration and science exploration, commercial missions with an emphasis on communications and launching improved satellites into space to support our military. Of the Space Shuttle program he said: We need to constantly strive to improve the risks. We will never achieve a risk-free flight. The General concluded by saying, The shuttle is a tremendous asset and we should figure out how to best use it. Rose informed the audience that to date more than 35,000 companies have commercially manufactured products that were developed by NASA for the U.S. space program. He said that NASAs Technology Transfer Program is well established and continues to produce successful partnerships. Last, but definitely not least, Maryniak gave an overview of the X-Prize competition. The X-Prize was founded in May 1996 in St. Louis, Mo., in order to stimulate the creation of a new generation of launch vehicles designed to carry passengers into space. It carries a $10 million prize incentive to jumpstart the space tourism industry through competition between the most talented entrepreneurs and rocket experts in the world, according to Maryniak. The $10 million cash prize will be awarded to the first team that privately finances, builds and launches a spaceship carrying three men up to 62.5 miles above Earth and safely returns. The team then has to repeat the launch with the same ship within two weeks. The deadline to complete the two launches is Jan. 1, 2005. To date, 24 teams from seven countries (U.S., United Kingdom, Argentina, Russia, Canada, Israel and Romania) are designing and testing spacecraft in the hope of claiming the coveted prize. (Above) Former astronaut and current vice president for Boeing Operatons on Floridas Space Coast, Bruce Melnick, answers questions at the astronaut event. (Below) Space Gateway Supports booth at the 40th Space Congress Exhibit Hall. (Above) NASA Administrator Sean OKeefe is interviewed after giving the keynote speech, while Lisa Malone, associate director of External Relations and Business Development at KSC, looks on. (Below) Gen. Michael Kostelnik, USAF retired and NASA deputy associate administrator for the Space Shuttle and the International Space Station, speaks about the future challenges the Agency faces. May 16, 2003 SPACEPORT NEWS Page 6Dr. Perez-Davis spoke of future technologies, such as nanotechnology and the importance of math and science, in future explorations. Dr. Soto Toro delivered a keynote presentation on the Space Shuttle program, and emphasized how students of today were the programs future. Bursian relayed the importanceGRANTS. . (Continued from Page 2) The research mission into the condition of the Oculina Banks aboard the NASA booster retrieval ship Liberty Star ended May 9 when it returned to Port Canaveral. Approximately 30 miles off the coast of Florida, stretching from Daytona Beach to Ft. Pierce, deepwater coral reefs called Oculina varicosa grow on the ocean floor, 200 to 300 feet beneath the waters surface. The deep-water Oculina reefs are quite unique, perhaps the only of their variety in the world. As such, in 1984, the National Oceanic and Atmospheric Administrations (NOAA) National Marine Fisheries Service designated a 92-square-mile portion of these reefs as a Marine Protected Area (MPA), meaning that no fish trawling is allowed within its boundaries. In 1994, the MPA was closed to all manner of bottom fishing; in 2000, the area was expanded to 300 square miles. One problem with this is the general publics lack of knowledge about the area. It certainly doesnt make Marine Scientist John Reeds job any easier. Reed is with the Harbor Branch Oceanographic Institution in Ft. Pierce and was the co-principal investigator on the eight-day expedition led by the NOAA Undersea Research Program with the help of NASA to learn more about the Oculina reefs. Reed has been studying the Oculina for 25 years. When I was first out of graduate school, said Reed, I was hired at Harbor Branch, and this was just after theyd discovered the deepwater Oculina reefs using the Johnson-Sea-Link submersible. They had just come across one of these 60to 100-foot-high reefs covered with coral. My first study, in 1976, was to see what lived in the coral, what used it for habitat. And over the next 10 years I did a number of studies. I began to study the invertebrates, and what I found out was that a small coral with a head the size of a basketball could hold up to over 2,000 individual animals and hundreds of species, from worms to crabs to shrimp to fish. It was an incredibly bio-diverse environment that we had never known about before. By 1980, the group realized this was a totally unique habitat found nowhere else in the continental U.S. and possibly nowhere else in the world. At the same time, I began to look at how fast the coral grows, said Reed. So my next study was to see how old their heads were. We were seeing coral heads the size of a Volkswagen Beetle. I did a study over two years and found that they actually grow very slowly, about a half an inch a year. So a large head could easily be 100, 200 years old. Then I did a core  which is just a sample within one of these reefs  to get some of the reef structure, and we did radio-carbon dating of the dead coral that came from the inside of the reef. What Reed and his colleagues learned was that the particular coral they had examined was 8,000 years old, meaning that the entire reef structure had been around 10,000 to 12,000 years. We also came to realize, Reed continued, how fragile the coral was: the branches themselves are the diameter of a pencil, and the reefs form into big bushes. So imagine how any heavy weight, like fishing gear dragging through it, could very easily crush it. Dr. Grant Gilmore of Dynamac and KSC engineers Mike Lane and Steve Van Meter assisted the expedition by operating the Passive Acoustic Monitoring System (PAMS) to monitor diverse underwater species. There was an indication that boats were coming from the Georgia coast and fishing with roller trawls so that they could easily roll over the bottom of the ocean. These rare coral reefs, home to hundreds of species including commercially important fish, were being destroyed. It would take hundreds of years to restore them, if they could be restored at all. My main concern is that while on paper this has been a protected area since 1984, its still being heavily fished, both by poachers and the unaware, said Reed. Tremendous damage can be done by an errant shrimp trawler going across one of these pristine reefs. One pass can destroy a great many reefs. Protected areas mean little if not for public awareness. Maps indicating the boundaries of the MPA would certainly help, as will a further understanding of the importance of these national natural treasures. There is public outcry about making too many protected areas, said Reed. But the size of the MPA is really a miniscule percentage of the overall area. These reefs are thousands of years old and there are no others like them in the world.! ""#$%&'()$*+,&-,'"%$+,$.-/"0&)$1&20of mathematics and shared real life work experiences hes had at KSC. Aguilar continued building relationships between university academia and potential future NASA projects by informing students and teachers on the opportunities and technologies NASA has to offer. Motorcyle helmets to be required on CenterKennedy Space Center will soon require the usage of motorcycle helmets inside the Cen-ters controlled areas. A meeting to discuss concerns related to the issue was held May 8 in the Training Auditorium. My feeling is that if you really believe in safety and health here at the Center, how can we not take this action, said Director Roy Bridges Jr.  I have elected to impose a policy of requiring that inside the gates of KSC we will wear a helmet. The new policy will take effect July 7. National statistics show those driving without helmets are at greater risk of injury than those who wear them.John Reed, co-principal investigator for the Harbor Branch Oceanographic Institution, checks out equipment on the Liberty Star, which will be the site of an undersea expedition to characterize the condition of deep-sea coral reefs and fish populations in the Oculina Banks stretching from Daytona Beach to Fort Pierce. SPACEPORT NEWS May 16, 2003 Page 7The Spacehab Payload Processing Facility in Cape Canaveral unveiled a tribute to the flight crew of Columbia May 1 with employees, legislators and astronaut Pam Melroy. Within the facility, the STS-107 crew performed all the necessary training and testing associated with the payload components prior to the Research Double Modules (RDM) final integration into the Shuttle. After a posting of the colors by the Patrick Air Force Base Honor Guard, Marty McLellan, vice president of Spacehab Ground Operations, gave an invocation then welcomed the crowd. Weve seen many astronaut crews come here to train, each one bringing something unique to human space flight, said McLellan. Proudly, our Spacehab and Boeing team worked alongside these talented people, supporting their training, helping them prepare for their mission. The STS-Spacehab dedicates tribute to Columbia crew107 crew was no exception. Their teamwork, drive and dedication, like those before them, were a testament to the human space flight program and to the wonder of space exploration and its value to humanity, he said. We were proud to be part of that team. Michael Kearney, president and CEO of Spacehab, then gave his remarks regarding the crew and fellow employees. He was followed by J.B. Kump, district director of Congressman Dave Weldons office. While few of us knew the astronauts as well as the people here at Spacehab, we still mourn them as if they were family, said Kump. It is appropriate that we join in this place with many of the people who have personal recollections of the seven Columbia crew members. Perhaps the most emotional moments of the tribute were whenSCIENCE. . (Continued from Page 1) astronaut Pam Melroy gave her personal recollections of the STS-107 flight crew. They were my friends. Three of them were my classmates going through Astronaut Training and the other three were in the class behind me. Of course, we knew Ilan because he had been with the office for several years, training for 107. They were all special See TRIBUTE, Page 8sacrificed their lives for, said STS107 NASA Mission Scientist John Charles, who is based at Johnson Space Center. I have to think thats what they would have wanted us to do. While all the experiments from the recovered containers have the potential to provide important data to scientists, two from the CIBX-2 commercial payload container could lead to life-saving treatments for cancer and severe lung infections. One of those studies successfully produced microscopic drug capsules that are prototype microcapsules to be used to deliver drugs directly to tumors or deep infections. Microcapsules, which are slightly larger than white blood cells, resemble tiny water-filled balloons when viewed under a microscope. The microcapsules are designed to be injected through catheters directly to problem sites or into arteries leading into solid tumors. The method allows patients to avoid severe side effects of traditional chemotherapy, including nausea, hair loss, immune suppression and fatigue. Several other microcapsule delivery systems, developed in part through data provided by previous Shuttle research missions, have been patented and are undergoing trials. The systems were jointly developed by NASA-JSC, the Institute for Research and Instrumentation Technology Associates Inc. (ITA) When it comes to microencapsulization technology, space is our best classroom. Through observing how capsules form with various drug formulations in space, we continue to learn how to improve manufacture of various microcapsules here on Earth, said Principal Investigator Dr. Dennis Morrison of NASA-JSC. The other cancer-related experiment was an attempt to develop large, detailed Urokinase crystals in the microgravity environment of space. Urokinase is the enzyme that causes certain cancer cells to spread to other sites. Scientists are seeking to discover its structure so they can design a drug to hinder the enzymes effects. Although small crystals were found in the recovered samples, researchers will not know how useful the crystals are until they are analyzed by X-ray diffraction. We got lucky. The unit could just as well have burned up on reentry, said John Cassanto, president of ITA, which manufactured the experiment containers; solicited commercial, NASA and student experiment clients; and integrated experiments into the container. ITA was a co-sponsor with NASA of the microencapsulization experiment and the prime sponsor in partnership with the New Millennium Corp. of the Urokinase experiments. Cassanto and Morrison are two of the co-principal investigators on the enzyme study. Other researchers, educators and students were also thankful to have their experiments available for analysis. Barry Perlman, a teacher at Pembroke Pines Charter Middle School in Florida, said his students were inspired by the recovery of their Tin crystal experiment. It was the third crystal-growing experiment flown by Perlman and his students. Through working with the Shuttle experiments my students come to place higher value on their science and math courses. They see facts and figures translated into real-life science, said Perlman. Because of the accident, they likely never will forget this project and will have even greater respect for the work of the astronauts. Guy Ethridge, KSC project manager of a moss growth experiment recovered from Biological Research in Canisters (BRIC) containers, said the experiment samples were somewhat altered by effects of the Columbia accident. But science can potentially be obtained. That was also the case for another BRIC project recovered, a roundworm study, in which the specimens survived the accident. While the original intent of the experiments is fundamental research, they have the potential of addressing issues regarding astrobiology, said Ethridge. Astronaut Pam Melroy, Spacehab Ground Operations Vice President Marty McLellan and others unveiled the companys tribute to the Columbia crew. 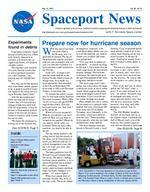 Page 8 SPACEPORT NEWS May 16, 2003 John F. Kennedy Space Center Managing editor. . . . . . . . . . . . . . . . . . . Bruce Buckingham Editor. . . . . . . . . . . . . . . . . . . . . . . . . .Jeff Stuckey Editorial support provided by InDyne Inc. Writers Group. NASA at KSC is located on the Internet at http://www.ksc.nasa.gov USGPO: 733-133/600031Spaceport News Spaceport News is an official publication of the Kennedy Space Center and is published on alternate Fridays by External Relations and Business Development in the interest of KSC civil service and contractor employees. Contributions are welcome and should be submitted two weeks before publication to the Media Services Branch, XAE-1. E-mail submissions can be sent to Jeffery.Stuckey@jbosc.ksc.nasa.gov Remembering Our Heritagein the restricted telephone hot line forecast discussions with the National Hurricane Center. When hurricanes threaten, 45th Weather Squadron advises the Kennedy Space Center Director and the 45th Space Wing Commander, who jointly declare Hurricane alert Conditions, known as HURCONs. Individual offices have different actions they need to take at different HURCON conditions.What Should I Do?You should finish all your outdoor work before tropical storm winds arrive (39 mph). The most important notice is the Evacuation Announcement. You can save yourself and your family a lot of grief by being well-prepared and ready to evacuate immediately when the evacuation is announced. Beating the wave of traffic leaving the coast will save you considerable frustration driving and increase the chance of finding an inland hotel. Further information and hurricane preparedness, training is available from the KSC Emergency Preparedness Office (853-6861) and 45th Weather Squadron (8538410). Telstar II was launched from Cape Canaveral on May 7, 1963, which was the 17th consecutive successful launch of a Delta vehicle. The 175-pound spacecraft was launched for the American Telephone and Telegraph (AT&T) Company to conduct wideband communication experiments between the satellite, the ground station at Andover, Maine, and other U.S. and foreign stations. Scientists also placed emphasis on studying the effects of natural and artificial radiation on communication satellites. The satellite was a 34.5-inch aluminum sphere covered with solar cell patches. The initial communications test was a successful TV transmission from Andover to Goonhilly Downs, England, from the satellite on its fourth orbit. Both color and black and white television were transmitted to Great Britain and France during the 10th orbit. With apogee nearly twice that of Telstar I, it would provide longer periods of communications between the U.S. and Western Europe. In July, Telstar II went dead during its 450th orbit, and subsequent efforts to reactivate the satellite by radio signal did not work. The cause of the failure was not known, but AT&T said that telemetry data had given no indication that radiation damage caused the satellite to fail. Finally, the company gave the good news in mid-August that the satellite resumed operating for the first time when Bell Telephone Laboratories received and transmitted sound and television pictures. The cause of the satellites restoration, like its silence, was not known. Later that month, portions of the March on Washington for Jobs and Freedom, telecast by nationwide networks within the U.S., were transmitted via Telstar II to Europe. In September on his 66th birthday, Pope Paul VI recognized the 175th anniversary of George-town University by a special broadcast to the U.S. with the satellite. Communications satellites had been used by AT&T to transmit a small portion of the overseas telephone calls that normally would have gone by underwater cable. After each call, the telephone company would call up the user and ask about the quality of the call. The satellite brought live American television to the Soviet Union for the first time on theTelstar II vastly improves worldwide communications Telstar II launch on May 7, 1963SEASON. . (Continued from Page 1) weekend of the assassination of President Kennedy, as well as the funeral that followed. The Soviet newspaper Izvestia devoted a page tentitled, Texas and Telstar, to an analysis of these events: The technical wonder of the 20th century, came into our lives with Americas mourning and brought us the cry of battle, a battle between light and darkness raging this week on the other side of the earth. TRIBUTE. . (Continued from Page 7) people. Melroy described Commander Rick Husband: Just the most spectacular person Ive ever met in my life. One of the things you may not know about him was that he had a beautiful singing voice. I remember the first time that he sang for our astronaut class in a skit. When he opened his mouth, the entire class stared at him aghast because his voice was so beautiful. He was used to having this kind of shock effect on people and kept singing while he waggled his eyebrows just a little bit at us. She then talked about Pilot Willie McCool, who was the sweetest person in the office. He never said a negative word about anybody or anything. He was so kind and thoughtful. Melroy also described Mission Specialist David Brown, who interviewed her the year she was selected to the Astronaut Corps. One of my favorite stories about Dave was when we were going through the selection process, at the end of it only the nerviest group of interviewees dared to give a skit for the people who were interviewing us, said Melroy. He put together a skit, The Top 10 Reasons Why You Werent Selected As An Astronaut, with himself playing the part of David Letterman, to whom he bore somewhat of a resemblance. His number one reason was you showed up at your interview wearing a Star Trek uniform. A moment of silence was observed at 9:16 a.m., the moment Columbia was scheduled to land at KSCs Shuttle Landing Facility. McLellan then unveiled the memorial and thanked Florida Memorial Gardens and Rinker Materials for donating the materials used to build it, as well as the Spacehab employees who helped assemble the tribute.